Nose: Vegetal peat. Burnt matter. Hint of smoke. Probably over-oxidized as this was opened for quite a while. 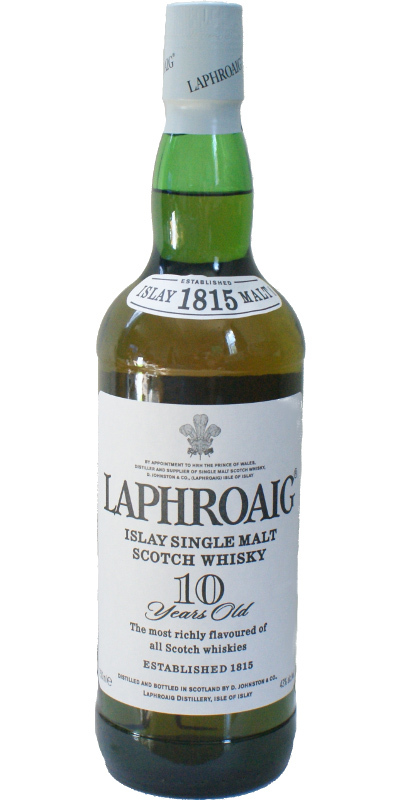 It has lost the signature Laphroaig style of pungent peat smoke. Lesson learnt: Never leave an opened Laphroaig for too long! Anyway it becomes pretty complex. Sea wind and briny notes, some smoke caramel, underneath there is some sweet and salty notes. I like how the peat smoke evolve into old and dusty room smell. The medicinal notes is lingering behind all the above. Interesting.Palate: Peat smoke yes. Ash. Tar. Burnt organic matter. On top of that, some sweetness, saltiness, nuttiness. Some kind of banana cake notes. Weirdo. Pretty soft mouth feel. Finish: Warmth, smoky. Some herbal and medicinal notes. Pretty long. Balance: This is pretty balance. The palate is a little bit weird to me, but the finish is surprisingly good. The over-oxidized nose although make it more complex, but the complexity doesn't seem to make the whisky better.Final: This rating does not represent the original smell and taste of this whisky as I've left the bottle opened for too long. I remember this used to be an awesome whisky when it was first opened.Verdict: An over-oxidized Laphroaig. Peathead please do not do that. A very good, complex scotch whisky with a huge flavor, especially for such a young age. But would be so much more if its flavor wasn't being restrained by chill-filtration. Cutting the artificial coloring and bottling at 46% abv wouldn't hurt either. God knows it didn't hurt Ardbeg's sales. But still, a very respectable, quality spirit. Complex and multilayered. Peat smoke, mineral, brine, seaweed, and medicinal. Beneath this initial punch is a subtle sweetness: floral notes, pepper, mild aniseed, and very slight mint. Bitter peat smoke, mineral, and oak arrive and continue into the development. Road tar, brine, vegital, seaweed. There is also a distant metallic, aluminum note. A little water brings out the brininess. Bitter peat and road tar continuing from the taste, sweet vanilla appears in the background, and tannins emerge rather quickly. A long, sustained finish. Bitterness gradually loses out to sweetness. Great and honest whisky, no frills, just 100% Islay! Of course, here too the smoke dominates, for 10 years old a very nice maturity. Departure very short, only the smoke remains for a very long time. If you exhale through your nose after 10 minutes, the smoke is back! A remarkable example of Islay peat-influenced malt whisky. This can be used as a standard of comparison for all other Islay malts. Very well-balanced. It’s more than just peat-smoke. There are other flavors in the mix, making it multi-dimensional. Peat smoke pervades, with some vanilla/nougat in the background. A bit of salt air. Strong peat smoke, iodine, and salt water. Smoky, with some seaweed, along with sweet toasted oats and charred wood. Salty, you smell the sea. Smoky and salty. You taste the peat.